In materials management, the ABC analysis (or Selective Inventory Control) is an inventory categorization technique. ABC analysis divides an inventory into three categories- “A items” with very tight control and accurate records, “B items” with less tightly controlled and good records, and “C items” with the simplest controls possible and minimal records. The ABC analysis suggests that inventories of an organization are not of equal value. Thus, the inventory is grouped into three categories (A, B, and C) in order of their estimated importance. ‘A’ items are very important for an organization. Because of the high value of these ‘A’ items, frequent value analysis is required. In addition to that, an organization needs to choose an appropriate order pattern (e.g. ‘Just- in- time’) to avoid excess capacity. ‘B’ items are important, but of course less important than ‘A’ items and more important than ‘C’ items. Therefore ‘B’ items are inter group items. ‘C’ items are marginally important. Various names of ABC analysis Or Similar Techniques. 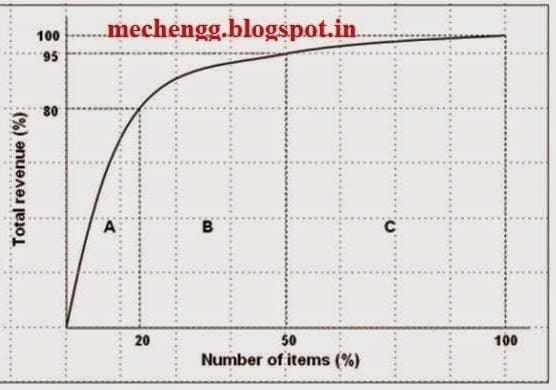 A-items are goods which annual consumption value is the highest; the top 70-80% of the annual consumption value of the company typically accounts for only 10-20% of total inventory items. 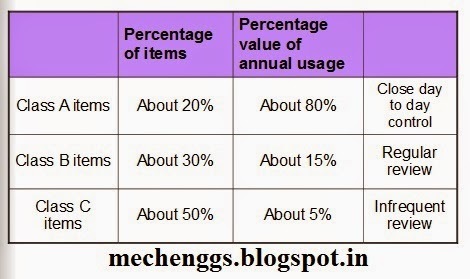 B-items are the inter class items, with a medium consumption value; those 15-25% of annual consumption value typically accounts for 30% of total inventory items. C-items are, on the contrary, items with the lowest consumption value; the lower 5% of the annual consumption value typically accounts for 50% of total inventory items. Through this categorization, the supply manager can identify inventory hot spots, and separate them from the rest of the items, especially those that are numerous but not that profitable. physical security as well as audit frequency. documentation, audit controls in place.